Our handtools are deeply engraved on hard brass, with extra thick heads for better heat retention. The outside forms are cut closely to the design in order to improve the sighting. All our handtools have a domed face which greatly aids 'putting the tool down', whilst giving more life to the binding than a flat tool can. We now have masters for over 1500 designs to suit most periods of binding. 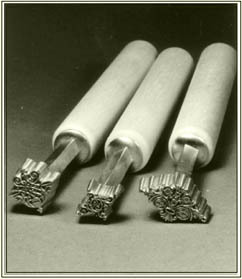 This includes a good range of intaglio tools for the blind tooling of early bindings, an interesting range of Art Nouveau patterns and some authentic Napolionic designs. If custom designs, or tools for restoration purposes are required, we can produce exact copies from artworks, good photocopies, photographs or pieces of leather from existing bindings. Type high dies for use in a blocking press can be supplied from all handtool patterns.